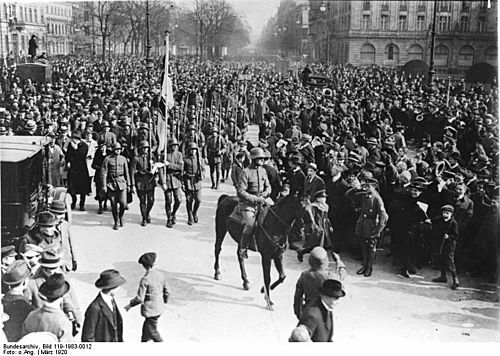 Freikorps troops enter Berlin in 1920. The occasion: The Kapp Putsch. 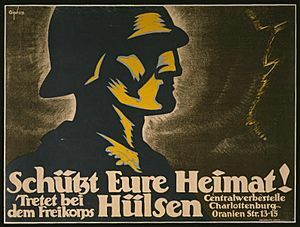 The word Freikorps (German for "Free Corps") was first used for voluntary armies in Germany. After World War I the term was used for paramilitary units. The Freikorps got famous at the time of the Weimar Republic to fight in some towns against the Communism. The first freikorps were started by Frederick II of Prussia in the eighteenth century during the Seven Years' War. Other freikorps were started during the Napoleonic Wars and were commanded by people such as Ferdinand von Schill and later Ludwig Adolf Wilhelm von Lützow. 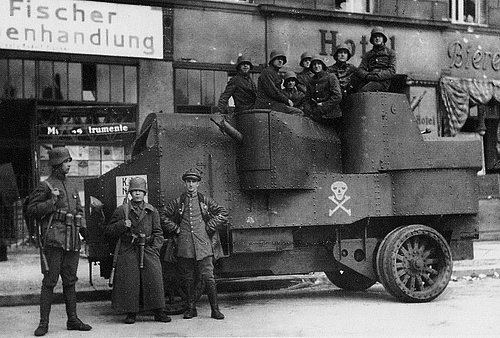 The freikorps were thought to be not reliable by regular armies and were mostly used as guards and for minor duties. The meaning of the word changed over time. After 1918, the word was used for the paramilitary organizations that were started in Germany by soldiers who came home after losing World War I. They were the main paramilitary groups during that time. Many of these returning soldiers were not able to return to a normal life, and joined a Freikorps to again be a part of a military structure. Others were angry at losing the war and joined to fight against Communists or get revenge. They were liked and supported by Minister of Defence Gustav Noske, a member of the Social Democratic Party of Germany, who used them to stop the German Revolution and the Marxist Spartacist League, and also to murder Karl Liebknecht and Rosa Luxemburg on 15 January 1919. They were also used to defeat the Bavarian Soviet Republic in 1919. In 1920, Adolf Hitler had started his political work as the leader of the very small and unknown German Workers Party (that was soon called the National Socialist German Workers Party, NSDAP (or Nazi Party)) in Munich. 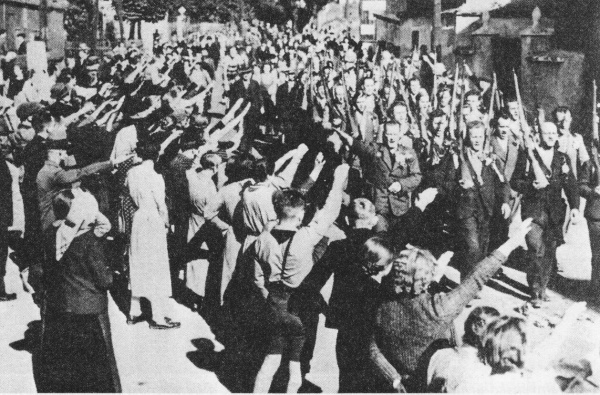 Many people who would join this party had been in the Freikorps, including Ernst Röhm, future leader of the Sturmabteilung, or SA, and Rudolf Höß, the future Commander of the Auschwitz concentration camp. Hermann Ehrhardt, who started the Marinebrigade Ehrhardt, and his deputy Commander, Eberhard Kautter, did not want to help Hitler and Erich von Ludendorff in the Beer Hall Putsch. Freikorps leaders gave their old battle flags to Hitler's SA and SS on Nov 9, 1933 in a very big ceremony. Historian Robert Waite said that Hitler had many problems with the Freikorps. Many of the Friekorps had joined the SA, so when the Night of the Long Knives happened, they were targets for being murdered or arrested and this was also done to Ehrhardt and to Röhm. Waite also says that in Hitler's 'Rohm Purge' speech to the Reichstag on July 13, 1934, that Hitler said that the Freikorps were enemies of Germany. In 1939, in the Polish September Campaign, Freikorps Ebbinghaus, was started to work behind the frontlines. It was not very good at this work and was sent to fight as an army unit but was not good at this either and was ended in less than one year. - rescued the Iron Division after a 12,000 mile march. - Fought in the Baltic. - was trapped in Thorensberg by the Latvian Army. Was rescued by the Rossbach Freikorps. Freikorps Facts for Kids. Kiddle Encyclopedia.